includes everything you see below plus FREE access to the Member's Area! 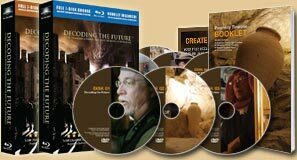 Decoding the Future will take you from the classroom to the Middle East as you explore the ruins of ancient sites and get additional input and views from a panel of theological experts. This course may very change the way you understand how these last-days will unfold and explains why these things must inevitably take place. ON BLURAY, DVD AND DIGITAL HD. The Ruins of Sardis And more!